Uncompromising, Full-Service, Slopeside Living…AT LAST! Madeline Residences, Telluride’s premier four-diamond, full-service ownership opportunity, features beautifully finished & furnished residences with only the highest quality including granite countertops, beautiful new white oak flooring, travertine floors in the kitchens & baths, Wolf and SubZero kitchen appliances, Kohler Bath Fixtures, & AIR CONDITIONING! 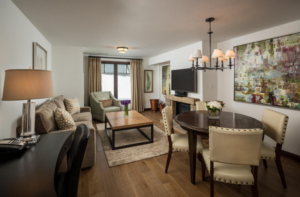 This comfortable 1 Bedroom/1 Bath fully-furnished Madeline Residence offers a rare opportunity to be a part of Telluride’s hottest project at an incredibly affordable price point. Great southern exposure and easy access to Madeline’s new 4,000sf pool deck & hot tubs.